For this dish, I decided to place the focus onto the flavor profile. 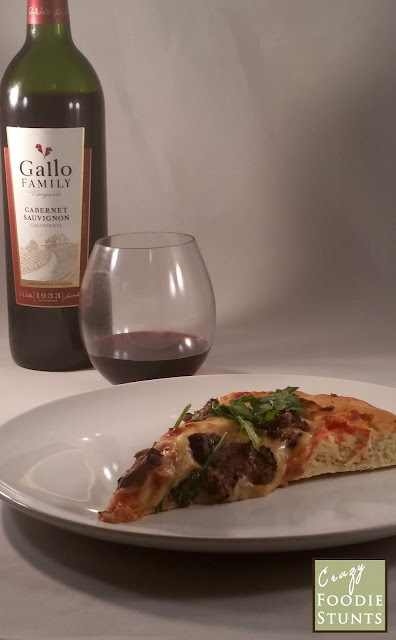 Gallo Family Vineyards has decided to use this opportunity to challenge the team at #SundaySupper to pair its wines with pizza toppings in celebration of National Pizza Month, which is October in the United States. For it, each participant was able to select two wines to pair so I chose chardonnay and cabernet sauvignon, primarily because I'm most familiar with them, so it would theoretically result in better pairings, but also because they are my favorite wines to drink. Not familiar with Gallo Family Vineyards? Well, they have provided a store locator so you can find their wines. Also, please consider giving them a 'Like' on Facebook, following them on twitter and instagram in addition to subscribing to their YouTube channel. Compensation was provided by Gallo Family Vineyards via Sunday Supper, LLC. The opinions expressed herein are those of the author, and are not indicative of the opinions or positions of Gallo Family Vineyards. When I was conceptualizing the dish, I thought I might pair the chardonnay with French flavors that complement chicken but it looked like many of my peers were also preparing chicken pizzas so I thought I'd pair the cabernet sauvignon. 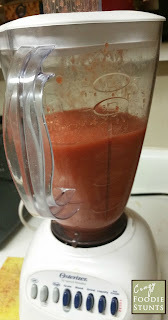 My favorite way to pair it is with beef so, per what has become my standard operating procedure, I consulted The Flavor Bible and was reminded of a flavor pairing I used a couple of years ago with a New York steak dish. It suggested to pair steak with arugula, Parmesan and balsamic vinegar. It has become one of my favorite flavor profiles and I knew it would pair nicely with the cabernet sauvignon so I used it again. I adapted a number of different sources to create this dish. I used the pizza dough recipe found on page 31 of Fabio's Italian Kitchen by Fabio Viviani with Melanie Rehak with the pizza sauce found on thekitchn.com. For the toppings, I used the balsamic marinade found at food.com and paired it with Ina Garten's arugula topping found on foodnetwork.com. 1. Prepare the flank steak. Place the steak in a resealable plastic bag, then combine the garlic, balsamic vinegar, 1/4 cup olive oil in a small bowl and season with pepper. Pour the marinade over the steak and refrigerate for at least 1 hour. 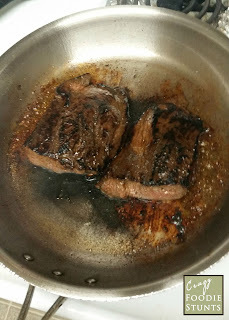 Remove the steaks from the marinade 30 minutes before searing it and discard the marinade. Pat the steak dry and heat the remaining oil in a large skillet. Once it starts to smoke, sear the steak, approximately 4 to 5 minutes on each side. Remove from the pan and let it rest for 5 minutes, then slice the steak into thin strips. It may also be necessary to cut each strip into bite size pieces. Set aside while you prepare the pizza dough. 2. Prepare the pizza dough and pizza sauce. Using a mixer with the dough hook attachments, combine the yeast, water and sugar in a large mixing bowl. Add the flour in small amounts, mixing well in between each addition until the dough is tacky but not sticky. Remove the dough from the bowl using olive oil if necessary and place on a lightly floured a flat surface. Cover the dough with a dry towel and let it rise for 30 minutes. 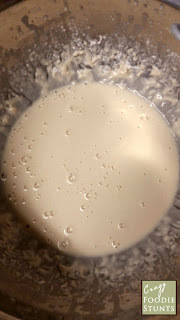 While the dough is rising, preheat the oven to 425° Fahrenheit then combine the first three ingredients in a blender and drizzle in approximately 1 tablespoon olive oil. Blend the sauce, then season with salt and pepper to taste. 3. Assemble the pizza. Once the dough has risen, Roll the dough, shape it and transfer it to a sheet pan or pizza pan. 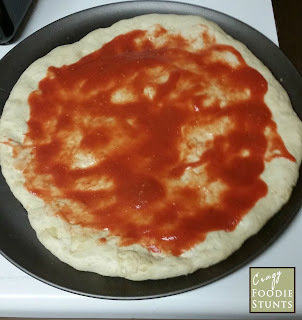 Spoon some pizza sauce onto the dough, leaving three quarters of an inch space from the edge of the dough. Shower the pizza sauce evenly with the cheeses then top the cheese with the balsamic steak. Bake in the preheated oven until the crust is crispy and the cheese has melted, approximately 9 to 10 minutes. 4. Prepare the arugula and finish the dish. While the pizza bakes, combine the lemon juice and olive oil in equal parts in a small bowl, then season with salt and pepper. Toss the arugula with just enough to dampen, a scant couple of teaspoons. Once the pizza is finished in the oven, top it with the dressed arugula, slice and serve with your favorite Gallo Family Vineyard wine. There are a couple of execution issues I'd like to discuss. First, my source recipe for the instructs to marinate the steak for only 30 minutes to 1 hour but I actually let it sit in the marinade overnight for a stronger balsamic flavor. Secondly, I wanted to specify here that my first attempt at pizza dough failed because I didn't measure the flour. Furthermore I had trouble mixing the flour after a few additions so I might add it all in at once the next time I attempt it. Overall, I was fairly satisfied with the dough because it was comparable to some pizzas I have had delivered. Honestly, pairing wine with pizza initially seemed unnatural to me, however the cabernet did pair with the flavors of the pizza exceptionally well so I will probably do so again the next time I make pizza at home. Lastly, I'm not the only National Pizza Month celebrant, so be sure to review the others listed below. If you invite my sons over for dinner, I think they could help your family polish off the 10-pound pizza. They'd also LOVE your steak pizza---well, so would I!!! I love steak on pizza! This looks SO good, DB! I'm not sure I've had steak on pizza but what a great idea! This is definitely a Cabernet-worthy pizza! 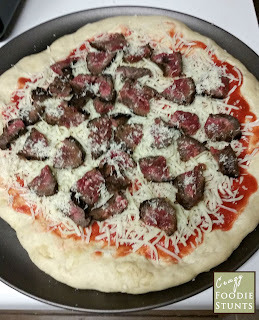 Tim would be all over this steak pizza! What a great pairing! I love steak. I love pizza. No doubt that I will love this wonderful combination!! Love steak on pizza and love that you added arugula (I've done the same!) Your recipe sounds delicious! What an upscale pizza! I love the steak and arugula on top. I love putting arugula on steaks and flatbreads. This looks delicious!